Just Cause 3 has explosions. No, that's not right. Just Cause 3 is about explosions. They are its raison d'être; its sine qua non; it's essence; it's purpose. They are wondrously complex, multi-faceted creations—cascading chains of chaos, staggered in timing to paint impressionistic fireballs across the colourful landscape. All of which I know from having played it over Gamescom, and not from this dev diary about Just Cause 3's explosions. It leans a little too far into the tell don't show school of marketing, but should still give you a rough idea of the carnage awaiting Rico. 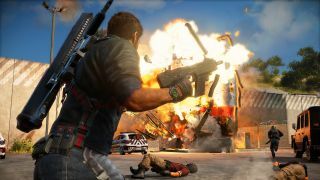 Just Cause 3 is out December 1. For more, check out the recent Gamescom game footage.